Being eco means not buying and wrapping everything up in sight without thought. According to the Use Less Stuff Report, wrapping paper and shopping bags alone account for about 4 million tons of trash annually in the US. Even the production of it all causes harm – think of all of that ink and paper. Gift wrap is used for only such a brief time, and it’s not even recyclable! Some may think reusing old gift wrap or giving an unwrapped gift is being lazy and cheap, but you can just use being “eco” as an excuse (to save money and our planet). Get creative with wrapping by using reusable bags, old newspapers or magazines, tea towels, scarves, shoelaces to tie, old buttons or cut up textiles, and tree-free cards or make your own. 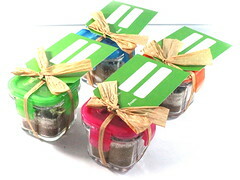 The bonus is that you are giving so much eco-ness along with each gift! Tempered glass containers are perfect to hold your homemade cookies and jams. It’s the gift package that keeps on giving. Instead of throwing yesterday’s paper in the recycling bin, why not use it to wrap today’s present? This blog series is created from The Alphabet of Avoidance by Lisa Borden. Lisa is a champion for change, mom of 3, and owner of Borden Communications, and she believes, “If you aren’t outraged, then you just aren’t paying attention.” You can follow her on twitter @LisaBorden for rants, raves, inspiration and information. This entry was written by Melissa, posted on December 12, 2012 at 10:45 am, filed under Wean Team. Bookmark the permalink. Follow any comments here with the RSS feed for this post. Both comments and trackbacks are currently closed.